Spaghetti & traditional spices, grated parmesan cheese. Just add tomato paste. When we were growing up, dinner was a hearty, flavorful meal made from wholesome ingredients and prepared with mom's special touch. But with today's hectic lifestyles, who has time for all that work. With Kraft Spaghetti Classics, a homemade meal like your mom made is only minutes away - all you need to do is add tomato paste to the specially-blended, tangy herbs and spices. 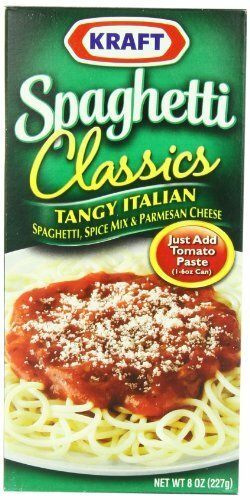 Kraft Spaghetti Classics will help you make a great-tasting meal your whole family will love - in only 15 minutes. If you have any questions about this product by Kraft, contact us by completing and submitting the form below. If you are looking for a specif part number, please include it with your message.